Escambia County is a county of the U.S. state of Alabama. Its name is said to be from the name of a river in an American Indian language (see Escambia County for another possible origin). As of 2000, the population was 38,440. Its county seat is Brewton. Escambia County was established on December 10, 1868. The county was declared a disaster area in September 1979 due to damage from Hurricane Frederic, and again in September 2004 due to damage from Hurricane Ivan. The name "Escambia" was given to the county from the river which the Creek Indians had named "Shambia", meaning "clear water". According to the U.S. Census Bureau, the county has a total area of 2,468 km² (953 square miles). 2,454 km² (947 sq mi) of it is land and 14 km² (6 sq mi) of it (0.58%) is water. As of the census² of 2000, there were 38,440 people, 14,297 households, and 10,093 families residing in the county. The population density was 16/km² (41/sq mi). There were 16,544 housing units at an average density of 7/km² (18/sq mi). The racial makeup of the county was 64.40% White, 30.79% Black or African American, 3.01% Native American, 0.24% Asian, 0.03% Pacific Islander, 0.40% from other races, and 1.13% from two or more races. 0.99% of the population were Hispanic or Latino of any race. In the county the population was spread out with 24.10% under the age of 18, 9.70% from 18 to 24, 28.90% from 25 to 44, 23.70% from 45 to 64, and 13.60% who were 65 years of age or older. The median age was 37 years. For every 100 females there were 102.70 males. For every 100 females age 18 and over, there were 102.70 males. 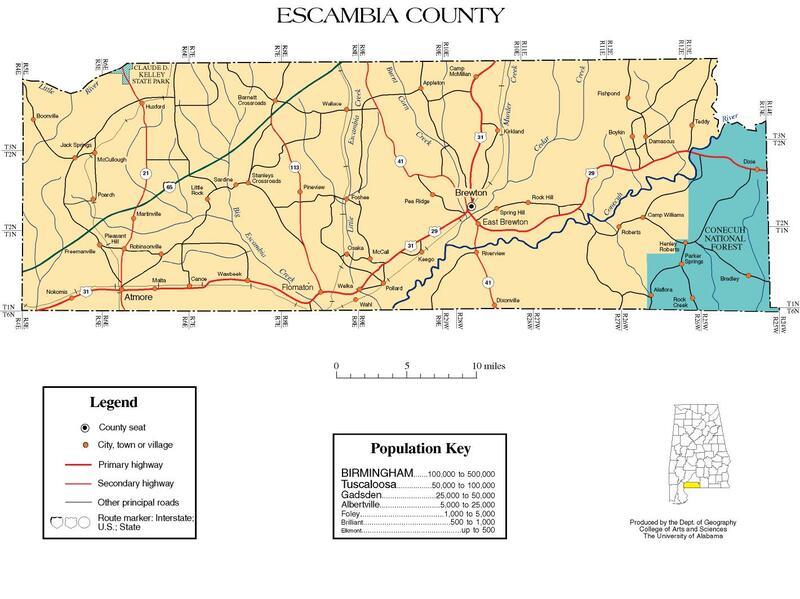 Escambia County map of roads/towns (map © 2007 Univ. of Alabama). This page uses content from the English language Wikipedia. The original content was at Escambia County, Alabama. The list of authors can be seen in the page history. As with this Familypedia wiki, the content of Wikipedia is available under the Creative Commons License.